Tennessee Lady Vols Head Coach Holly Warlick congratulates the opposing team after what would be her final game as Lady Vols head coach, a first-round NCAA Championship tournament loss to UCLA at the Xfinity Center in College Park, Maryland. Nobody understands the high level of expectations for the Tennessee women’s basketball program more than Holly Warlick. Warlick was right by Pat Summitt’s side – first as a player, then as a coach – as Summitt built the Lady Vols into a dynasty. The Knoxville native helped the Lady Vols win all eight of their national titles and make 19 trips to the Final Four. She took over for Summitt in 2012 once Summitt was diagnosed with early-onset dementia, Alzheimer’s type and stepped down. Summitt died in 2016. 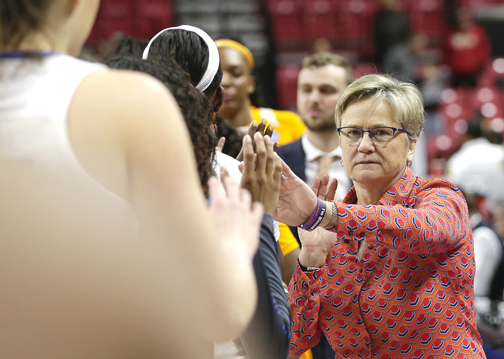 But Warlick’s 38-year association with the program has come to an end. Having failed to generate enough consistent success, Warlick was fired last week by UT athletic director Philip Fulmer. “Holly has dedicated most of her adult life to the University of Tennessee and the Lady Vols program,” Fulmer said. “She loves Tennessee, and Tennessee needs to always love her back. She was front and center as this program developed into the model for women’s intercollegiate excellence. Warlick had a 172-67 record in seven seasons. The Lady Vols made it to the NCAA Tournament regional final in three of her first four years, but haven’t advanced beyond the second round in the last three seasons. The Lady Vols haven’t been to the Final Four since their 2008 NCAA championship season. Tennessee barely snuck into the tournament this season and was eliminated in the first round by UCLA to cap a 19-13 season. The Lady Vols failed to reach 20 wins for the first time since 1975-76 and finished below .500 in conference play (7-9) for the first time in program history. Fulmer gave Warlick a three-year contract extension in August that ran through the 2021-22 season with an annual salary of $690,000. Her buyout is estimated at about $710,000. Fulmer is now charged with hiring only the third Lady Vols head coach in the modern era of women’s basketball. Even in a time of increasing parity in the sport, it’s a job that still holds major allure because of the program’s rich tradition and resources. Warlick had the unenviable task of following in the footsteps of a legend. Summitt remains revered like few coaches in America, not just for her extraordinary success but for what she meant to women’s basketball. Warlick led the program while mourning the death of her best friend, former coach and mentor. She did it with class and professionalism every step of the way. “I feel terrible for her,” UConn head coach Geno Auriemma says. “Every school is entitled to have their own coach, obviously, and Tennessee is entitled to have whoever they want as their coach. I don’t know the details of all that. Because of the program’s stature in the sport, the intrigue surrounding the job opening has been much greater than normal. Nearly every coach remaining in the NCAA Tournament at the time of the Warlick’s firing was asked about their interest in the position. Speculation on who will replace Warlick has run rampant. Will Fulmer stay in the Lady Vols family? Will he hire another female coach? Lin Dunn, a Tennessee graduate and longtime college and WNBA coach, says the next hire needs to have NCAA championship experience as either a head coach or an assistant. “I feel strongly about this. Tennessee is not a development program. This is a championship program,” explains Dunn, a Dresden native. “Whoever they hire must be capable to win championships and know how to recruit championship players. Despite not contending for championships the last few years, Tennessee has remained an attraction for high-profile recruits. But translating the talent into wins that match the class rankings has been elusive. It remains to be seen if any players on the current roster will transfer, or if incoming recruits will appeal to the NCAA to get out of their signed letter of intent. If most remain in the program the cupboard won’t be bare for the next coach. Warlick arrived at Tennessee in 1976 as a scholarship 400-meter runner on the track team. She walked on to the basketball team and became the first player in Tennessee athletics history – men or women – to have her jersey retired. Warlick’s imprint will remain on the program, but a new coach will soon be walking the sideline. The history is deeply entrenched, and the standards established. Win titles, and employment will be secure. Lose games, and the search will begin again. “You better be able to get your arms around a fan base that can be for you one minute and send a U-Haul to your house the next minute,” Landers says.